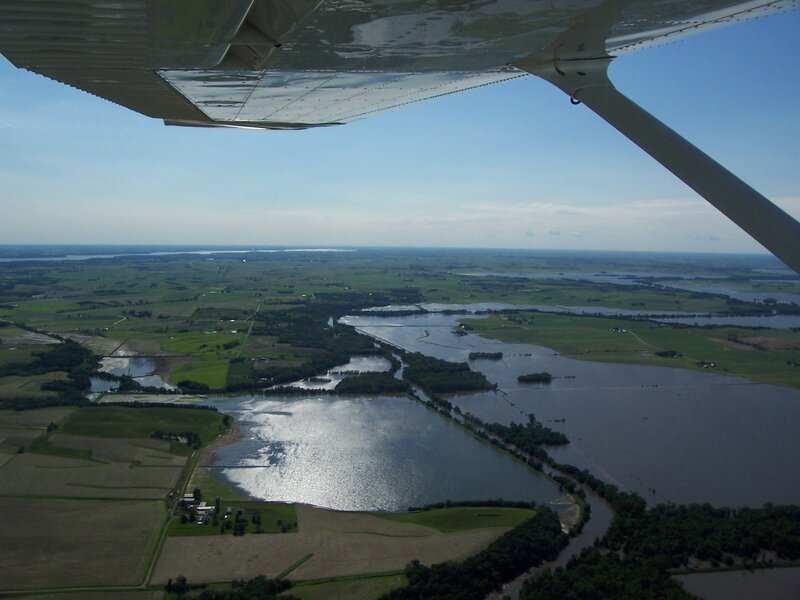 >On Sunday afternoon, our son-in-law took us up in a plane to look at some of the local flooding. The picture below shows the dam located about a half mile from our home. Two of the flood gates are open and water is boiling out at an astounding 100,000 cubic-feet-per-second. The entire Des Moines River bottom below the dam is flooded. From the air, the dam looks like a bridge across a huge lake. Directly downstream from our house is a farm place entirely surrounded by muddy water. The south branch of the Skunk River is out of its banks north and east of Pella. 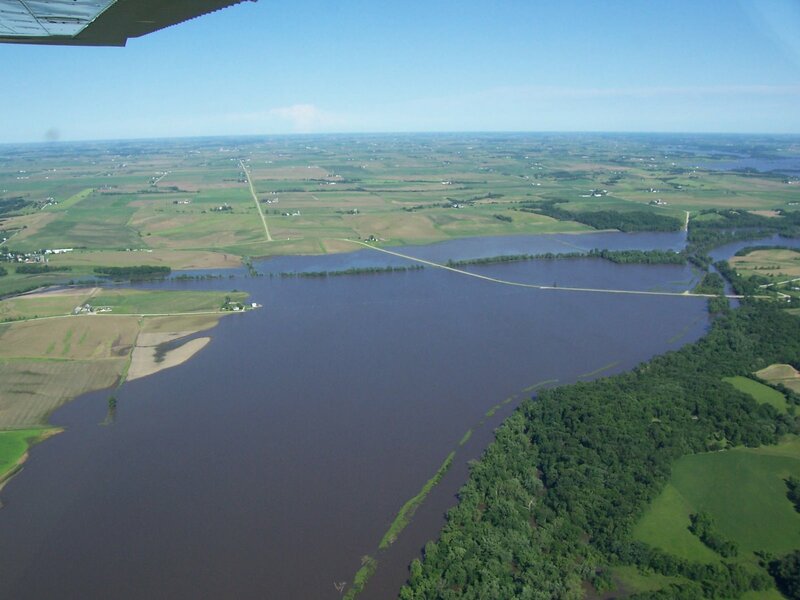 The picture below shows some of the Skunk River flooding in the foreground, but the body of water in the left background is the flooded Des Moines River. The picture below shows a section of the road between Pella and Peoria. Traffic is still going through (vehicles are visible if you look closely), but the river has become a lake. My sister and her husband have about 120 acres of newly planted farm ground under Skunk River water. 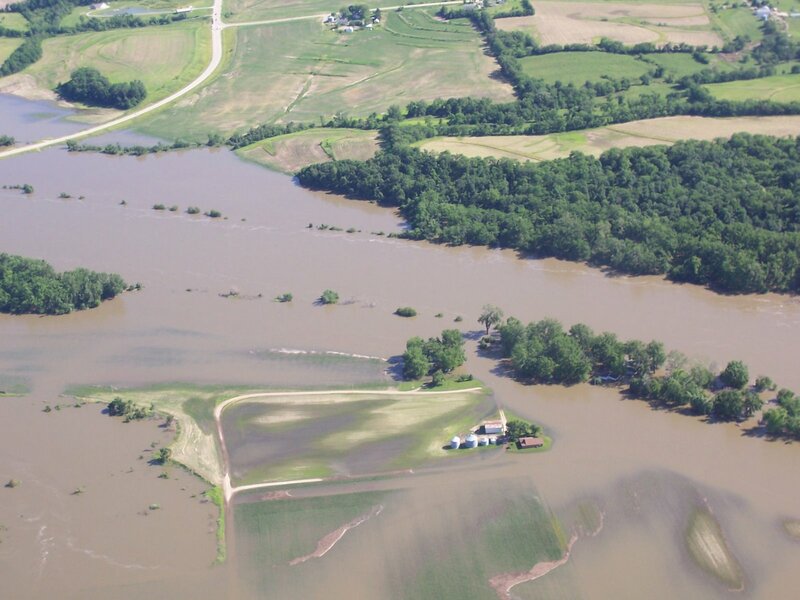 According to various news reports, about 16% of Iowa’s 25 million acres are under water. The Associated Press reports that around 36,000 people in 11 Iowa counties were displaced by flooding. About 25,000 of those people were in Cedar Rapids alone, where more than 400 city blocks were covered by waters from the Cedar River. In God’s providence, we’ve had no rain for the last few days and water levels are beginning to drop across the state. My son’s family in Cedar Rapids is now permitted to take showers on odd-numbered days. The water level in the city has dropped ten feet. Officials anticipate it will drop the additional nine feet to bring it below flood stage by Saturday (four more days). As the water recedes in Cedar Rapids, it is becoming apparent that the basements of many homes and businesses have collapsed or are about to collapse. Recovery for many homeowners will mean more than gutting the house and starting over from a bare frame. It may mean starting over from the very foundation. May the recent severe weather and catastrophic flooding bring many people to start over on the firm foundation of God’s Word. May many hearts be touched by an awareness of God’s power and an acknowledgement of His sovereignty.